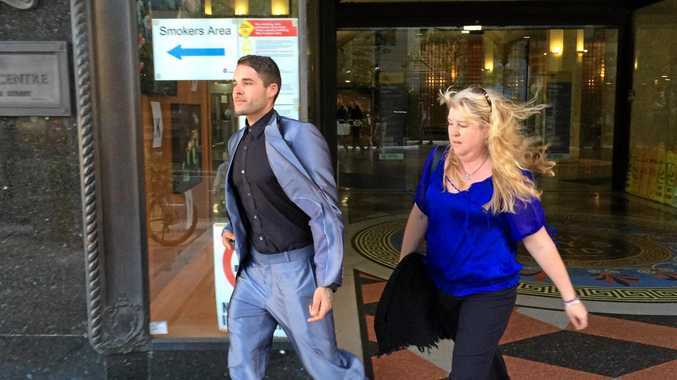 ALLEGED police bashing victim Corey Barker has told a jury officers threatened to smash his phone and made racist remarks and rude gestures behind his mother before he was assaulted. Mr Barker, who turns 28 on Saturday, fronted Sydney Supreme Court in the trial of six police officers accused of bashing him in custody and lying in court. He said he was arrested after filming police "mistreating" his friends, following a domestic disturbance in January 2011. The officers' statements claimed Mr Barker had thrown a plastic bottle at police as they attempted to arrest a man and a woman and that after his arrest, Mr Barker had hit Senior Constable David Ryan Hill in the face. Mr Barker said he never threw anything, but was still charged for throwing a missile at police. He said his first memory of being in the Ballina police station was Constable Luke Christopher Mewing demanding the code for the phone he used to film the incident. "He came and demanded the code for the phone, and I knew the code but I wasn't going to give it to him," Mr Barker told the court. He said Mewing threatened to "smash your phone on the ground" if he did not tell him the password. "I just said, 'Well, I'm not going to give you the code," Mr Barker said. He added withholding it made him feel he had "a bit of power on my side". Mr Barker admitted he was agitated while kept in a holding cell and was hitting the clear plastic wall. He claimed officers "made derogatory terms" about his race. The court was previously read a statement from Sergeant Robert Campbell McCubben in which he recalled Mr Barker's mother coming into the station. Mr Mewing said Mr Barker called his mother a "useless f**king c**t" and was acting aggressively towards her, so he asked her to leave. Mr Barker's account was very different. He told the court he was calm and thought "Yes, I'm saved" when he saw his mother walk into the station. But two officers standing behind her made rude gestures behind her back, stopping when she turned around to look, Mr Barker said. He said he became agitated and started banging the plastic wall again, and officers told his mother her presence was "making me worse and she needs to leave". Mr Barker said he complied when officers later asked him to put his hands behind his back so he could be handcuffed, but nothing happened so he turned around. "They told me to turn back around so they could handcuff me... I obliged," he testified. "I didn't get handcuffed again, the door just opened and officers grabbed me by the arms." CCTV footage played in court showed Mr Barker being walked into another room with his hands behind his back before being taken to the ground by police, handcuffed and dragged face down towards the cells. It did not appear to show him punch Mr Hill. The officer's defence barrister, Emmanuel Kerkyasharian, told the court on Monday the CCTV footage was a time-lapse video and captured only about one-third of what actually occurred. Mr Barker said he had been pushed forward, stumbled and was then "swarmed by officers" who were "running at me from each direction". "I was just thrown everywhere, I ended up hitting a table and the ground, but then I had a lot of weight on me," he said. He recalled "my face and head hurting, and my hands hurting quite a lot". "I just surrendered it and the next minute I was being dragged," he said. A recording of an intercepted phone call between Snr Const Mark Woolven and his lawyer was also played in court. Mr Woolven can be heard saying CCTV footage made it "quite evident" Mr Barker did not punch Mr Hill and it was "friendly fire". "I saw someone hit a police officer and I naturally thought it was him," the recording stated. "But it turned out it wasn't him, I think it was friendly fire from another police officer trying restrain him." Mr Hill, Mr Mewing, Const Ryan Charles Eckersley and Probationary Constable Lee David Walmsley have been charged with assault, trying to pervert the course of justice and lying in court. Mr Woolven and Sgt Robert Campbell McCubben are charged with trying to pervert the course of justice. Mr Barker will take the witness stand again on Friday.